In our opinion, this letter is on par with the Declaration of Independence as an expression of eternal values that we should always aspire to reach. Based on living in any particular time and place, limitations of knowledge and empathy are part of the human condition. Washington likely thought that he was just writing about religious freedom here; he could not see how perfectly his statement can be repeated today applying to ideas of race, class, sexual orientation, place of birth, or disabilities. As with the Declaration, America becomes greater when we can read it anew, with expanded boundaries of inclusiveness. To the HEBREW CONGREGATION in Newport, Rhode Island. WHILE I receive, with much satisfaction, your Address replete with expressions of affection and esteem, I rejoice in the opportunity of assuring you, that I shall always retain a grateful remembrance of the cordial welcome I experienced in my visit to Newport, from all classes of citizens. The reflection on the days of difficulty and danger which are past, is rendered the more sweet, from a consciousness that they are succeeded by days of uncommon prosperity and security. If we have wisdom to make the best use of the advantages with which we are now favored, we cannot fail, under the just administration of a good government, to become a great and a happy people. The citizens of the United States of America, have a right to applaud themselves for having given to mankind examples of an enlarged and liberal policy—a policy worthy of imitation.—ALL possess alike liberty of conscience, and immunities of citizenship. It is now no more that toleration is spoken of, as if it was by the indulgence of one class of people, that another enjoyed the exercise of their inherent natural rights. For happily the government of the United States, which gives to bigotry no sanction—to persecution no assistance, requires only that they who live under its protection, should demean themselves as good citizens in giving it on all occasions their effectual support. It would be inconsistent with the frankness of my character not to avow, that I am pleased with your favorable opinion of my administration, and fervent wishes for my felicity.—May the children of the stock of Abraham, who dwell in this land, continue to merit and enjoy the good-will of the other inhabitants; while every one shall sit in safety under his own vine and fig-tree, and there shall be none to make him afraid. May the Father of all Mercies scatter light and not darkness in our paths, and make us all in our several vocations useful here, and in his own due time and way everlastingly happy. PERMIT the children of the stock of Abraham, to approach you with the most cordial affection and esteem for your person and merits—and to join with our fellow Citizens in welcoming you to Newport. With pleasure we reflect on those days—those days of difficulty and danger, when the God of Israel, who delivered David from the peril of the sword—shielded your head in the day of battle:—And we rejoice to think, that the same spirit, who rested in the bosom of the greatly beloved Daniel, enabling him to preside over the provinces of the Babylonish empire, rests, and ever will rest, upon you, enabling you to discharge the arduous duties of CHIEF MAGISTRATE in these States. Deprived as we heretofore have been of the invaluable rights of free citizens, we now (with a deep sense of gratitude to the Almighty Disposer of all events) behold a Government, erected by the MAJESTY OF THE PEOPLE—a Government which to bigotry gives no sanction—to persecution no assistance; but generously affording to ALL liberty of conscience, and immunities of citizenship—deeming every one, of whatever nation, tongue, or language, equal parts of the great governmental machine. This so ample, and extensive Federal Union, whose basis is philanthropy, mutual confidence, and public virtue, we cannot but acknowledge to be the work of the Great God, who ruleth in the armies of heaven and among the inhabitants of the earth, doing whatever seemeth him good. For all the blessings of civil and religious liberty, which we enjoy under an equal and benign administration, we desire to send up our thanks to the Ancient of Days, the great Preserver of men—beseeching him, that the Angel who conducted our forefathers through the wilderness into the promised land, may graciously conduct you through all the difficulties and dangers of this mortal life; and when, like Joshua, full of days and full of honor, you are gathered to your Fathers, may you be admitted into the Heavenly Paradise to partake of the water of life, and the tree of immortality. Done and signed by order of the Hebrew Congregation, in Newport, Rhode-Island, August 17, 1790. Starting while Washington was on his way to New York to assume the presidency, he received many messages from civic, fraternal and religious organizations offering congratulations, praise of his deeds in war, peace, and politics, prayers on behalf of congregations or constituents, and more praise for what he would yet accomplish. Washington’s replies justly count among his most famous pronouncements, setting a boldly inclusive tone that helped our new nation survive and expand. In 1789-1790, nineteen religious congregations wrote to and received responses from the new president. 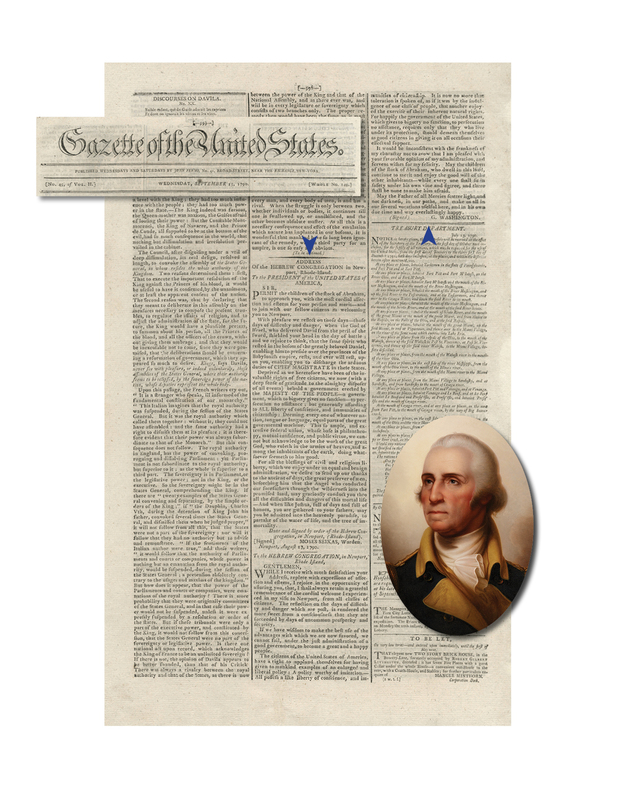 We were able to gather a collection of rare printings of sixteen of those letters, which helped establish the liberty to practice one’s own faith as a bedrock of the new Constitutional government. The collection, mainly of Gazette of the United States printings, included letters to and from congregations of Jewish, Roman Catholic, German Lutheran, Baptist, Protestant Episcopalian, Presbyterian, German Reformed, Quaker, Congregational, Dutch Reformed, and other churches. On August 17, 1790, on behalf of the Congregation Kahal Kadosh Yeshuat Israel, Newport merchant and banker Moses Seixas wrote an address to welcome George Washington. Seixas’ letter welcomed Washington to Newport, and congratulated his ascendancy to the Presidency. Seixas also expressed his hopes for the new government’s success and its commitment to religious freedom, that a “government erected by the majesty of the people, a government which to bigotry gives no sanction, persecution no alliance, but generously affording to all Liberty of conscience,” would be created under the new Constitution. Seixas most likely gave Washington the letter on the morning of August 18, when other Clergy and townspeople met with Washington to express their regard for him. Washington’s letter provides a textbook example of his very effective habit of echoing or incorporating into his response the best parts of a message to him. His most celebrated invocation, proclaiming that the United States would give “to bigotry no sanction, to persecution no assistance,” was adapted from Moses Seixas’ letter, but made even more powerful. The original letter is owned by the Morris Morgenstern Foundation, and is on long-term loan to the National Museum of American Jewish History. We were honored to have appraised the original prior to its exhibit, and to have arranged several loans to the museum. Each year, members of the Touro Synagogue in Newport read the letter in a public ceremony. The Boston Herald of Freedom first published both Seixas’ letter and Washington’s reply on September 7, 1790, followed by a Newport printing on September 9. We have handled the September 13, 1790 Newport, Rhode Island Newport Mercury printing (with Seixas’ letter to Washington, and his response, the “Touro Synagogue letter” printed in full on the first page) and September 15, 1790 New York Gazette of the United States printing. Both are available for appropriate museum loans. Email us if you would like a link to and/or a hard copy of a high resolution picture. We are happy to see this shared far and wide. Click here for a collection including: all of George Washington’s annual messages to Congress and their responses to each; letters from religious groups, state legislatures, municipal organizations, and a variety of other societies to the President, with his responses; Washington’s letter of resignation as commander in chief of the armies of the United States and his farewell orders to the armies, from late 1783.